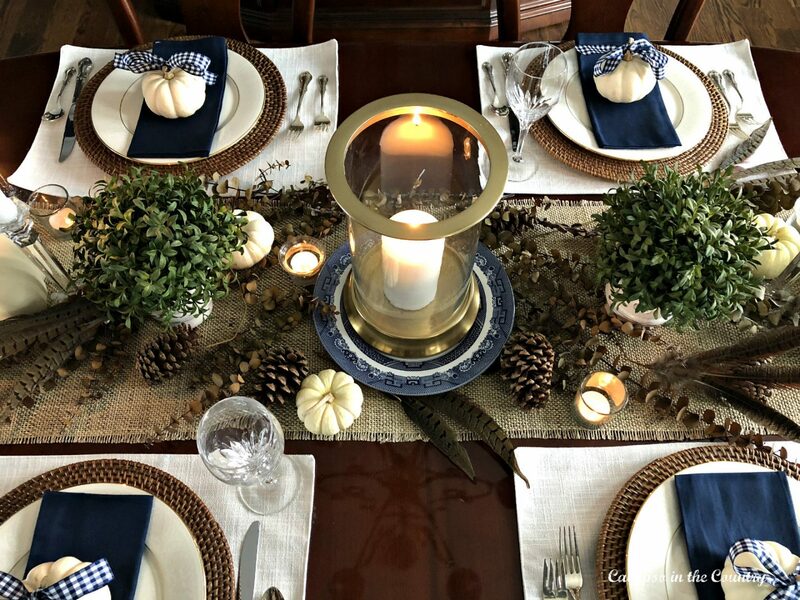 Have you set your Thanksgiving Table yet? Since we painted our dining room navy earlier this year, I decided to also try a new color combination for our table. Before the navy, the room was red for many years. Now that we made the change, I am loving all the new options I have for decorating with navy! Since I was inspired by the navy on the walls, I decided to add a touch of navy to the table. 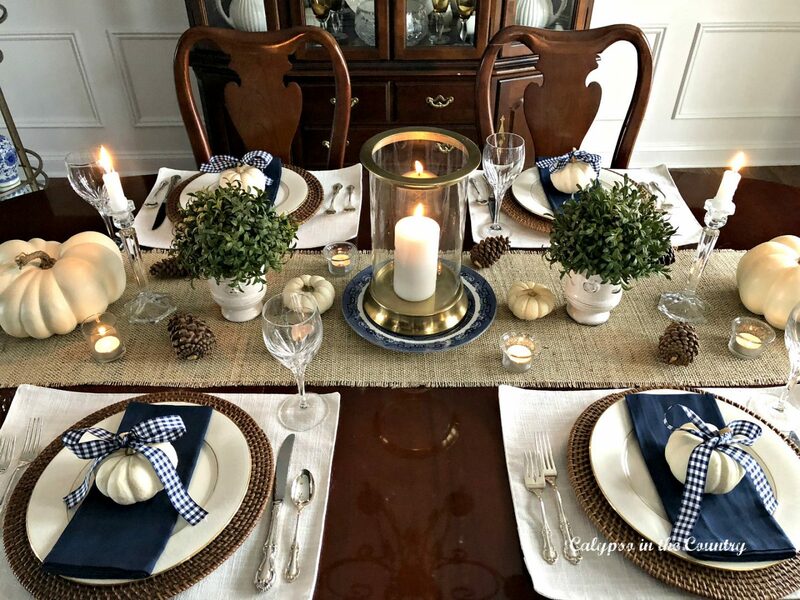 Maybe navy wouldn’t be the first color you would think about for a Thanksgiving Table, but I love trying something different. Recently, I found these navy napkins at World Market and thought they would be perfect for my table. Not only will they work for my Thanksgiving table but I know I’ll be using them in the spring and summer. 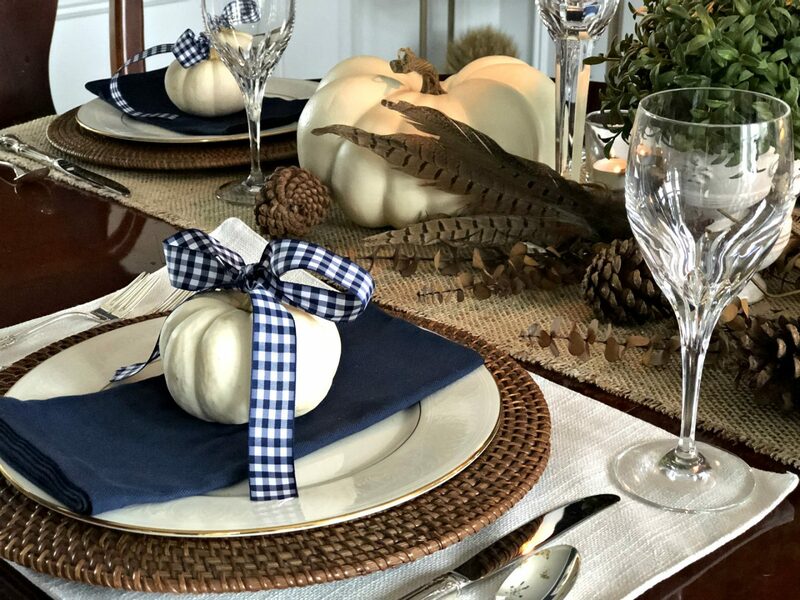 Since I still had some white pumpkins lingering around from my fall decorating, I added them to each place setting. The mini white pumpkins are real but the larger ones down the center are faux. I think white pumpkins have become my go-to item for fall decorating. They are so versatile and just so cute! Be sure to check out some other ways I have used white pumpkins in my decor – Decorating with White Pumpkins. 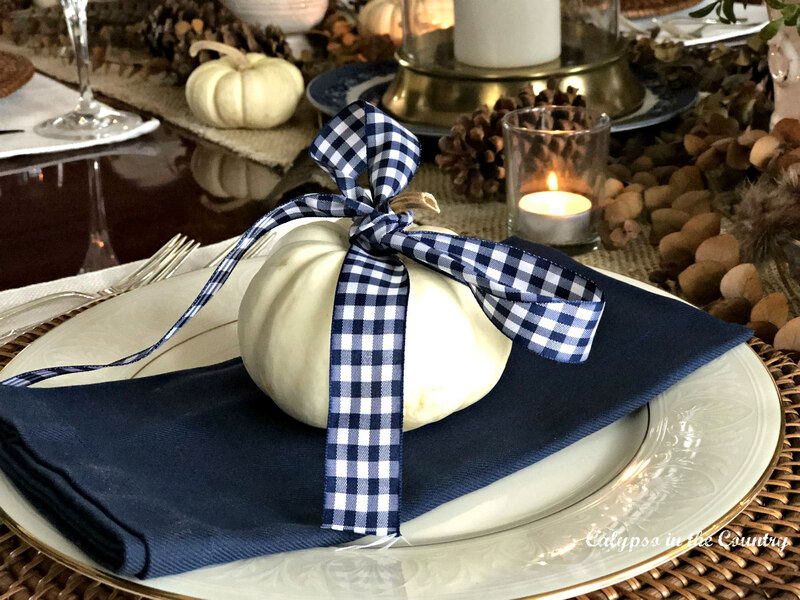 To dress up the pumpkins, I tied a simple bow on each one with a navy and white gingham ribbon. 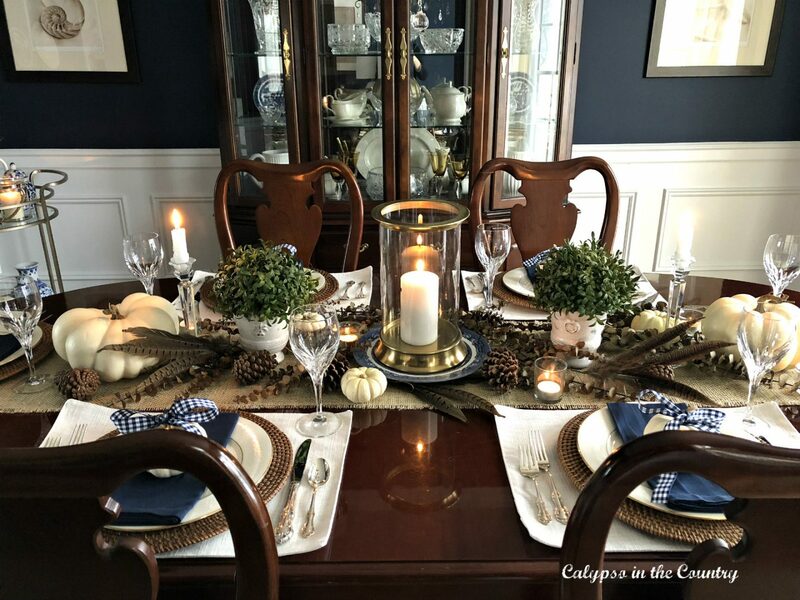 In order to restrain myself from going overboard with all the navy, I kept the other colors subtle for my Thanksgiving table. Simply layering cream colors with brown was just enough to let the navy stand out. 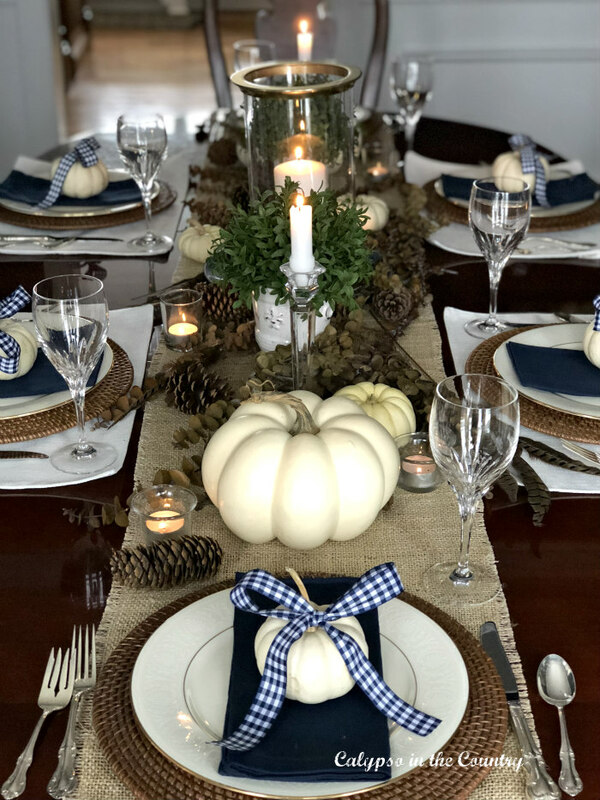 Covering my burlap runner with pine cones, feathers and brown eucalyptus allowed the center of the table to be neutral. There are so many natural elements to work with this time of year. Even though this year I used neutrals with the navy, I am already thinking about the colors I can use next year. 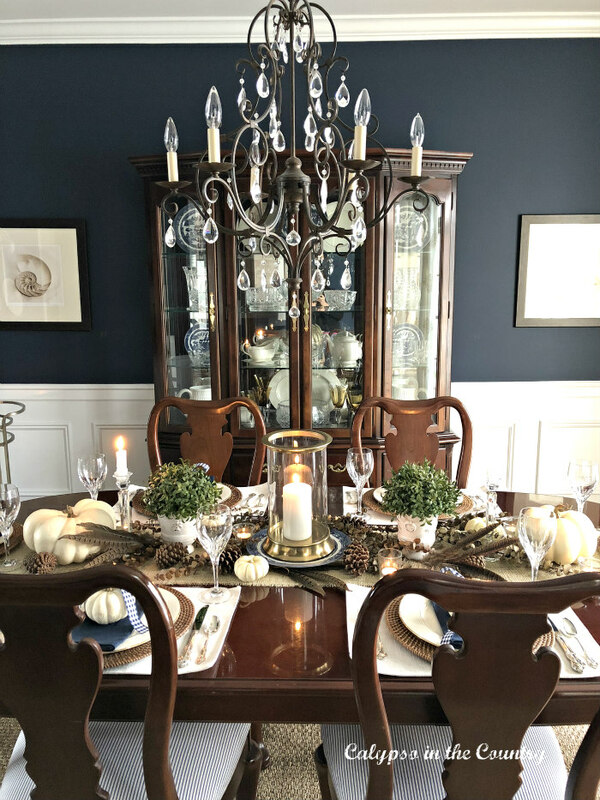 Changing from a red to a navy dining room has opened up a whole new world of colors for me to use! 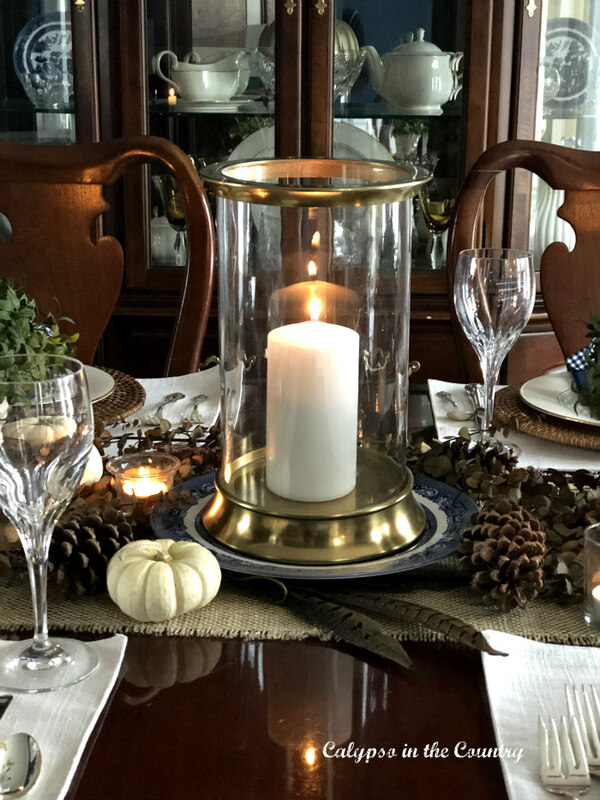 Since I didn’t do a floral centerpiece, I added one large glass hurricane with a candle in the center of the table. It never hurts to include some gold to the table. In case you didn’t notice, my china also has a gold rim. We registered for this pattern over 20 years ago and I am still happy I went with a classic look. Even though we don’t use our china very often, I love to take it out for holidays. Besides the china, I brought out the wedding crystal and the silver to make each place setting extra festive. Like I said, we don’t use the “good stuff” very often so it’s nice to give it some special attention. Although I love the table with the extra decor down the middle, I will be removing the eucalyptus and some of the pieces in the center when we actually eat dinner. This way is definitely more practical…after all, we need to make room for the food! I will be adding a few more chairs and settings as well. We host a large crowd and end up using the kitchen table for overflow too. 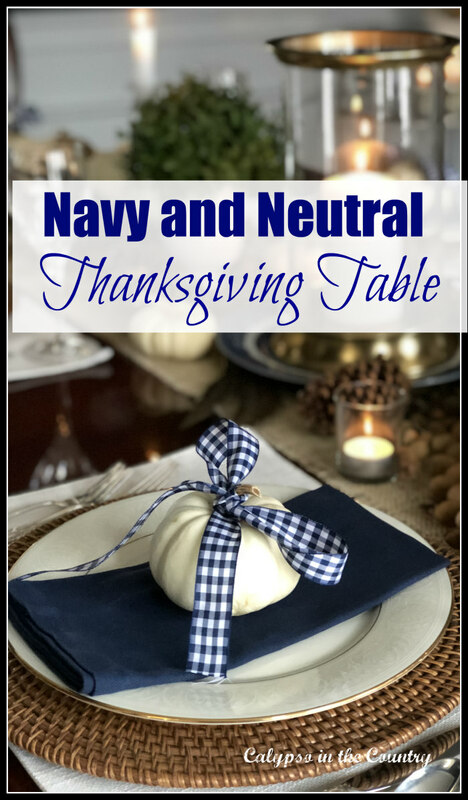 Thanks for stopping by to see my navy and neutral Thanksgiving table. I hope you have a Happy Thanksgiving! What colors are you using for Thanksgiving this year? Follow along so you don’t miss a post! It looks lovely, Shelley! You played off the navy walls just perfectly. We won’t be here for Thanksgiving, so our home is completely dressed for Christmas! Thank you so much, Carol! I hope you had a nice Thanksgiving! Shelley this is absolutely stunning. 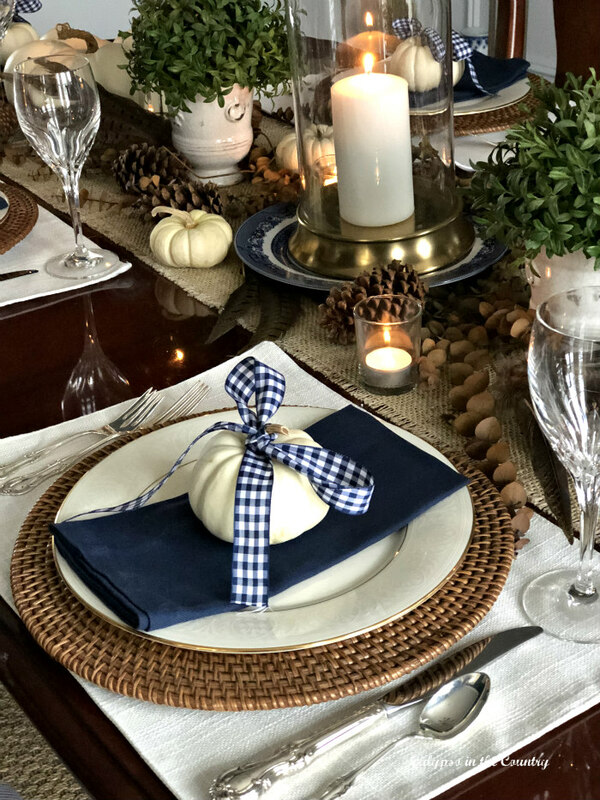 I love that beautiful hurricane in the center of your table and those cute gingham bows add just that special touch. Happy Thanksgiving and Many Blessings. Thank you so much, Marty…you are so sweet. Happy Thanksgiving to you! Ha! Too funny! I’ll trade my set table for a cuddly golden any day! Very classy and elegant!! Blue would look wonderful with orange too, as they are complementary colors. You’ll have options for years to come. Thanks, Carole! Yes, I thought about adding orange too but since I had lots of white pumpkins around, I used them. You’re right, now I have a plan for next year! Love it! I bet the high brass in The Navy and the Marines would also be envious! Thank you! Ha- that’s a thought! Perfection! So lovely!!!! Great job, Shelley. What a nice thing to say! Thank you, Bonnie and have a wonderful Thanksgiving! Thank you so much, Kay! Happy Thanksgiving to you! Your table looks so beautiful and elegant! Thank you for your kind words, Alice! Happy Thanksgiving! Your table looks beautiful! 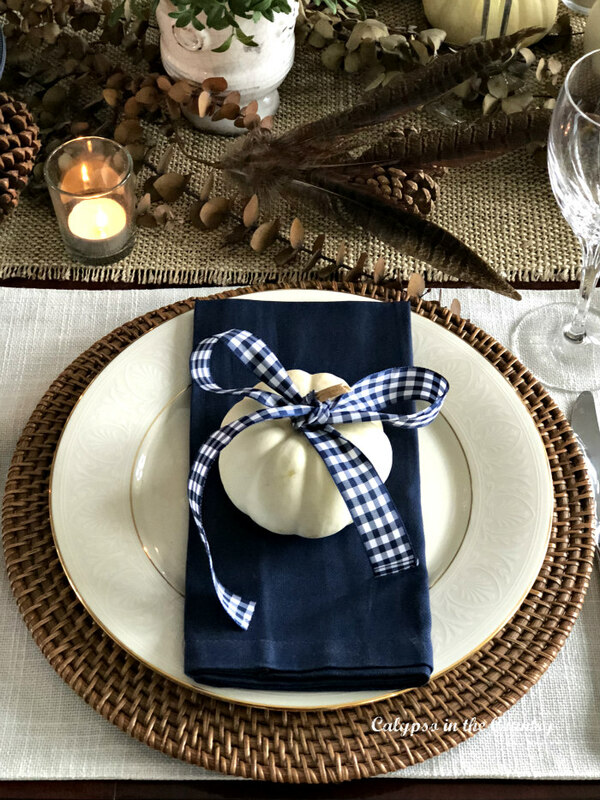 The navy napkins really pop on your white china and the small white pumpkins with gingham bows are the perfect touch for each place setting. I hope you have a wonderful Thanksgiving with your family. Thank you so much, Paula! I love any excuse to use navy…and gingham! Happy Thanksgiving to you as well! Beautiful table, Shelley and Happy Thanksgiving! Thank you, Kim! Have a Happy Thanksgiving! I enjoyed seeing your beautifully set table, I love the tailored look. I hope you had a wonderful Thanksgiving. Thanks so much, Karen! I hope you enjoyed your Thanksgiving as well! I really like the color of navy on your walls. Can you tell me what color it is? Thank you, Jan! The color is Naval by Sherwin Williams. The room used to be red and we repainted it navy last year. Thanks for stopping by!